The 100% owned Gold Creek project is located approximately 8 kms to the northwest of the Spanish Mountain deposit*. This project boasts the potential for discovery at a district scale. The 100% owned Gold Creek project was acquired by the former Eureka Resources Inc. in 2017 pursuant to an option agreement dated November 14, 2016. The property is adjacent to and on strike with a large, NW-SE trending gold-bearing zone bounded by the Quesnel River (“QR”) historic mine and mill owned by Barkerville Gold Mines Ltd (TSXV: BGM) to the NW and the Spanish Mountain project owned by Spanish Mountain Gold Ltd. (TSXV: SPA)* to the SE. Gold Creek also sits to the NE of Mt Polley (Imperial Metals). Exploration targets on the Gold Creek property are gold-bearing quartz veins and gold-silver bearing strata-bound zones of quartz and carbonate-altered quartz-veins that occur in the basal, black phyllite metasedimentary and greywacke volcanic sequences such as observed in the Spanish Mountain deposit*. Spanish Mountain, with a current resource of 306MT @ 0.39g/t for 3.88moz Au (M&I) and 450MT @ 0.28g/t for 4.11moz (Inferred)*, has been proposed as the possible source of the gold mined from some of the most prolific placer operations in British Columbia. The Bullion Pit, just 12 km (7.5 mi) away, produced over 5.4 million grams of gold (173,600 oz). Other known placer workings in the area include the Cedar Creek and the McKeown Placers. The Gold Creek area is once again a highly active exploration camp. There are numerous soil anomalies on the Gold Creek property over a 12km strike length. Much of the property is covered by overburden and remains unexplored. Kore has drilled anomalies in 2018 to extend the Camp Zone approximately 400m along strike. Low grade copper and gold has also been found in a highly sericite and silica altered diorite, called Zone 29. This zone borders the Camp Zone, where 2011, 2017 and 2018 drilling has focused. Kore is reviewing previous geophysical and geochemical work to understand the nature of the anomaly. The Gold Creek project is located 2km NE of the town of Likely in the Cariboo -- the heart of British Columbia's historic "Gold Rush" district. The Gold Creek project consists of 34 claims totalling 9,673 ha and approximately 8km to the NW of the Spanish Mountain deposit. Access is from Likely by all-weather gravel road. The site has well developed infrastructure and is just 70km NE of Williams Lake, a major regional centre serviced by an airport and railway. The property has several small roads that will provide easy access for drilling the claims. Previous work by Eureka has led to recent interpretation of Gold Creek as a SHV style deposit. These deposits are often large in size, with stratigraphically controlled gold mineralization. Based on extensive geochemical and geophysical surveys followed by drilling, a large NW-SE trending mineralized zone has been discovered -- the "Camp Zone". The property itself is an historic and current alluvial gold mining camp. Historical exploration has been sporadic and not very concentrated in location. In 2006, Bullion Gold Corp. began acquiring ground in the Likely area. In the summer of 2006, Bullion Gold Corp. purchased the Gold Creek claims from R. Mickle and during the summer of 2007, detailed geological mapping and sampling surveys were completed over the showing. A continuous chip sample, taken across 20.5 metres, had an average assay of 4.34 grams per tonne gold; including 9.55 grams per tonne gold across 8.5 metres (Assessment Report 30797). A 2008 program consisted of 6 diamond drill holes totalling 1,060 metres. A 2011 program consisted of 25 drill holes totalling 2,501 metres, of which 5 (1,037 metres) were diamond drill holes and 16 drill holes (1,464 metres) were reverse-circulation. The program outlined a gold-rich zone with sample values ranging from anomalous to 13.4 g/t Au. The purpose of the 2008 and 2011 drill programs was to test numerous gold soil anomalies as well as expand upon low-grade bulk-tonnage gold mineralization encountered in earlier drill programs. Analysis of the 2008 and 2011 drill data indicates that there appears to be a 300-metre-long zone of low-grade gold mineralization over widths of 75 to 100 metres open along strike to the southeast and to depth. Nine drill holes have tested this zone to date, indicating the zone dips steeply to the northeast and to a vertical depth of at least 250 metres. The Company completed a rock chip and soil sampling program at Gold Creek in late 2016 extending grid-work completed by the previous operator. Samples were analysed for gold by MMI techniques, and results indicate some weak to moderate anomalies ranging to 22.4 ppb Au. Rock chips were collected from showing areas and graded up to 8.65 ppm Au. Between 2008 and 2011 Tiex and Bullion spent a considerable amount of money on geophysics, soil sampling, MMI, and scattered RC drilling over soil anomalies. The best results from that period were in the area we are presently drilling. Highlights from that time are GC11-27 below, namely 41.2m of 0.893 g/t. Much of the drilling between 2008 and 2011 (and even in prior years by prior operators), drilling was challenging due to the heavily broken ground. RC, sonic, and core drilling were all employed to determine best recovery at lowest cost and yielded quite variable results. Fast forward to 2017 when Eureka optioned the property from Bullion (KORE is now 100% owner of the property). Three successful HQ holes were drilled in the target zone and recoveries were excellent using a good combination of drill bits and drilling muds. 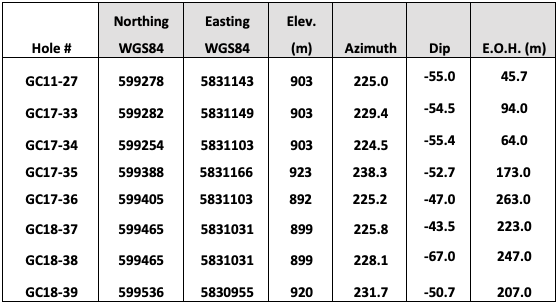 Results from the program are below with all holes (GC17-33, GC17-34, and GC17-35) encountering quite good intercepts of both high grade and low grade mineralization. From the 2017 program, it was concluded that none of the holes crossed the entire zone and there appears to be 2 higher grade zones, with narrower intercepts of even higher grade. Compilation of historical results were completed by KORE to determine drill targets, including the mapping of an arsenic MMI survey from 2011. The Company has observed gold mineralization to closely report to arsenic occurrences and is typified by hydrothermally altered sedimentary sequences of greywacke and argillite. Mineralization, consists of native gold and sulphides, and is similar to mineralization observed at the QR deposit to the west of the project area. The Gold Creek Property are primarily underlain by one fundamental element of the Quesnel belt - a basal, Middle to Late Triassic fine grained sedimentary unit (Nicola Group) that represents a basin-fill succession and commonly referred to as the 'black phyllite unit'. The clastic rocks are weakly metamorphosed and weakly to strongly deformed at deeper structural levels. In the eastern part of the property the rocks dip toward the southwest; in the western part, they dip to the northeast. The Quesnel Trough in the area of the Gold Creek Property is a well mineralized region that hosts a wide variety of deposit types. The principal recent exploration and economic development targets on the property are gold-bearing quartz veins and gold-silver bearing stratabound zones of quartz and carbonate-altered quartz-veined phyllite that occur in the basal, black phyllite metasedimentary succession of the Nicola Group. The mineralization in some black phyllite members have potential to be mined as large, bulk tonnage deposits. Gold occurs at Gold Creek in the same Mesozoic sedimentary package as at the Spanish Mountain deposit and the Company's FG deposit. The project sits in an ideal setting for sedimentary hosted vein (“SHV”) style mineralization and consists of accreted terranes with a basement containing carbonate lithologies intruded by Mesozoic or Cenozic plutonism. 2) Lower grade, bulk tonnage gold-bearing shale and siltstone represented by auriferous pyrite in a graphitic silty shale along a contact between argillites and greywackes. Compilation of historic conventional soils and mobile metal ion (MMI) soil sampling has been used to focus exploration efforts on a 2km x 3km arsenic in soil anomaly. This also demonstrates the extension of the Camp Zone along an 8.5km strike with widths of up to 400m. Additionally, this work has led to the identification of a nearby hornblende diorite intrusion, demonstrating an associated resistivity and magnetic anomaly with typical “halos” in the surface representation of Au, Ag and Cu in soils. This new "Zone 29" is potentially the heat source for hydrothermal alteration in the Camp Zone and new adjacent targets. The Camp Zone gold mineralization has been shown to both outcrop at surface and occur at shallow depths within drill holes. Early drilling suggests this deposit has the potential for a bulk mineable open pit resource as well as high grade underground development. The higher grade gold intercepts in drill holes within the Camp Zone show similarities to the high-grade zone of the nearby Spanish Mountain Gold Deposit. A large portion of the resource and the highest grades at Spanish Mountain occur at the contact between the greywacke and argillites, similar to mineralization at Gold Creek. This zone is contained within the same stratigraphic sequence (altered and silicified greywacke) and at a similar elevation. Compilation of historic arsenic in soils (see compilation map of historic arsenic on soils below) highlights an 8.5km long NW-SE trend that is coincident with the NW-SE trending Camp Zone and recent drilling. For these reasons, KORE believes that Gold Creek has the potential to host a major gold deposit. Gold mineralization to date has been found either within highly Fe-carbonate, sericite, and silica altered and pyritic fault zones or within fractured quartz-carbonate-pyrite veined greywacke and andesite tuff units in close proximity to larger fault zones. The strongest gold mineralization encountered to date occurs within vertical to near vertical sheeted quartz-carbonate-pyrite veins hosted predominantly within greywacke units which strike along a WNW-ESE trending zone that has currently been traced for approximately 300 metres. This zone remains open towards the east and to depth. KORE 2018 Focus Area - Camp Zone and Prospective Porphyry Intrusive. Compilation of historic conventional soils and mobile metal ion (MMI) soil sampling has been used to focus exploration efforts on a 2km x 3km arsenic in soil anomaly known as the Camp Zone. Review of the 3 HQ core drill holes from 2017 performed by Eureka Resources has shown that broad zones of gold mineralization are closely associated with elevated arsenic level. This pathfinder element will prove critical in defining the size of the zone currently being drilled as well as follow-up of its NW and SE extension. Previous drilling had targeted gold in soil anomalies on the property. While these gold in soil anomalies exhibit quite high gold in soils (as high as 89,000 ppb), these anomalies appear to be discontinuous due to varying thickness of glacial till which covers the majority of the property. Arsenic in soils show more coherent anomalies, and appear to be the best pathfinder element for the mineralized greywacke unit. Compilation of historic arsenic in soils (see compilation map of historic arsenic on soils) highlights an 8.5km long NW-SE trend that is coincident with the NW-SE trending Camp Zone and the recent drilling. This 8.5km long anomaly provides numerous additional drill targets for evaluation. In 2018, a total of 4 HQ drill holes for 940 meters were completed within the Camp Zone to test strike length extension of the successful discovery drill program completed in 2017. These holes step out approximately 300m from previous drilling. All 4 of the holes encountered long intercepts of gold mineralization, broad zones of alteration and mineralization within a Triassic Upper Nicola greywacke, interbedded with argillites, mudstones, and conglomerates. 2018 Drilling results combined with 2017 results including GC17-35 which intercepted 84.65 metres of one gram per tonne including higher-grade intercepts, confirms large widths of mineralization and the potential for a large resource. Visible gold was present in the core from one hole. Highlighted intercepts include 9.0m of 5.8g/t Au, including 1.5m of 32.2g/t Au in the final drill hole, GC18-039. Gold grades appear to be increasing at depth (open) and along strike in higher zones of arsenic in soils. · Hole GC18-38 intercepted 10.3 metres of 0.9g/t and 11.4 metres of 1.0g/t. · Confirms positive correlation in drill holes between elevated arsenic (>100 ppm) and anomalous gold and potential for a large resource within an 8.5km long arsenic-in-soils anomaly. · Recent drilling combined with historical trenching extends the Camp Zone to 400m+ along strike and is open ended along both strike and at depth. Every hole so far in the Camp Zone has encountered gold mineralization and is open along strike and at depth. Given that drilling to date encompasses less than 5% of the recently interpreted 8.5km long arsenic in soils trend, the potential for additional discovery is high and we plan to continue forward on our path to unlock further value on the property. GC18-38 Sample VG in core. GC18-36 was drilled at a 45 degree angle and a 225 degree azimuth and was 263m in length. This hole has encountered the same heavily pyritized fault zone as the 2017 program, but was able to cross almost the entire zone. This is the first hole in the history of the property to show appreciable amounts of arsenopyrite along vein margins, instead of just pyrite. GC18-37 is a 100m step out along strike from GC18-36. Again, this hole encountered the expected zones, but even heavier arsenopyrite than in GC18-36. This hole was drilled at a 45 degree angle, a 225 degree azimuth and was 223m long. GC18-38 was drilled from the same pad and same azimuth as GC18-37, but with a 70 degree dip. Our intent with this hole was to show continuity of the zone at depth. We are not only encountering the arsenopyrite from the last 2 holes, but are now seeing both chalcopyrite and visible gold in and along the vein margins. Spanish Mountain are exploring to the east of the “Camp Zone" and moving towards Gold Creek. We are currently 800-1,000m from our border with SPA. Kore’s program will focus on the extension of the Camp Zone and discovery of new zones to the NW beyond the offset fault. * The Spanish Mountain deposit has reported Measured and Indicated Resources of 3.5 million ounces (238 million tonnes grading .46 g/t gold) and Inferred Resources of a further 3.5 million ounces (311 million tonnes at .35 g/t gold). Source: Spanish Mountain Gold website August 2018. ** Eureka News Release, September 14, 2017. See SEDAR.